First Workshop of the Year; Maker Mentality! Come September 2nd, between the 1-2:20 pm in Harriman 210 (The Innovation Lab), to the Innovation Lab’s first workshop of the Fall 2015 semester! This is the Maker Mentality workshop, and it will inform all attendants on what exactly it means to be a maker, the tools and resources needed to get started, the various ways in which the Maker Movement is impacting the modern world, and the cool, interesting ways in which you can get started here at the lab! 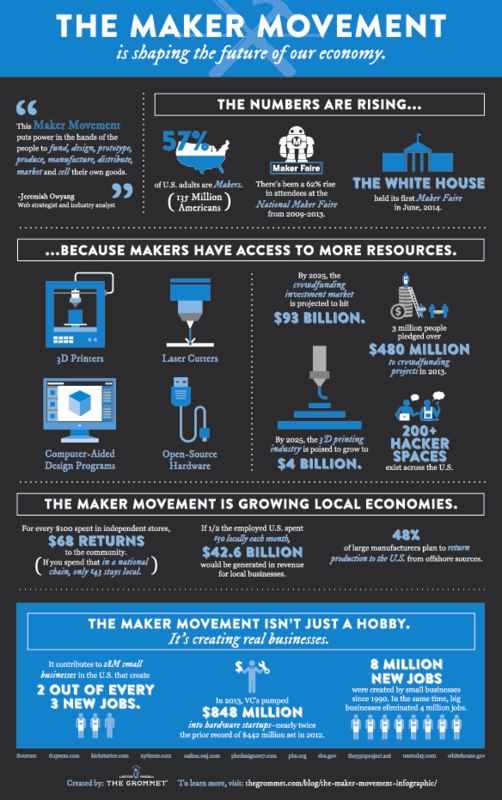 The Maker Movement is a movement that combines entrepreneurial spirit with modern technology. 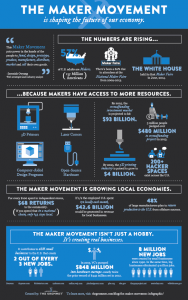 This movement accounts for approximately 28 million small businesses and the creation of 8 million new jobs in the U.S.
Maker’s use technology to help make everyday living simpler and more efficient, create new boundaries for the uses of modern technology, start up new businesses, and most importantly, use their imagination as fuel for innovation. During the workshop we will provide information on the resources we and others can offer to get started in the maker community, such as: Maker festivals, events, meetups, etc. The Innovation Lab from its opening has put much effort into networking in the local maker community, and will help you get your foot in the door. Make sure to come September 2nd!